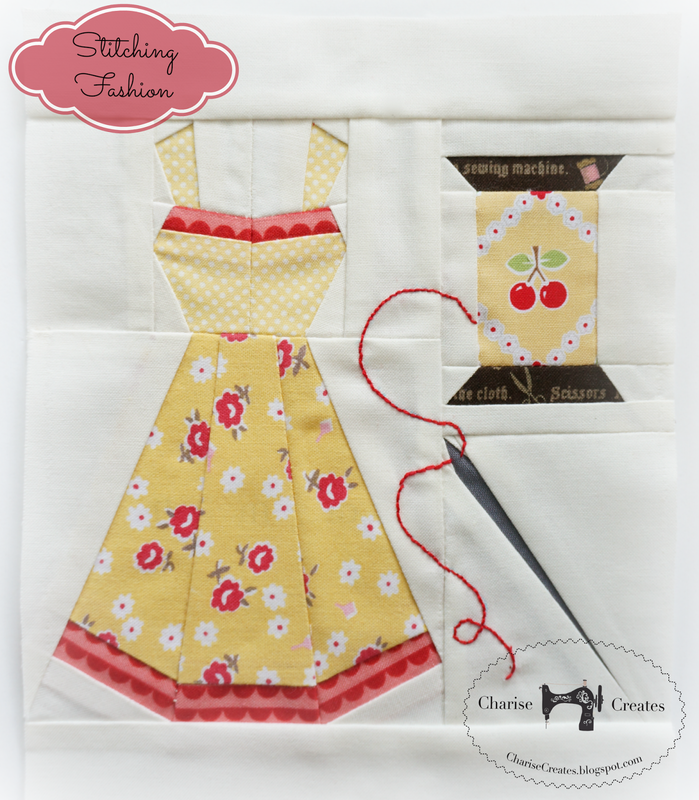 Today I am so excited to share my block for the Splendid Sampler Sew Along. The Splendid Sampler was the brain child of Pat Sloan and Jane Davidson. For one year, they are sharing two - 6" blocks per week from over 80 different designers. 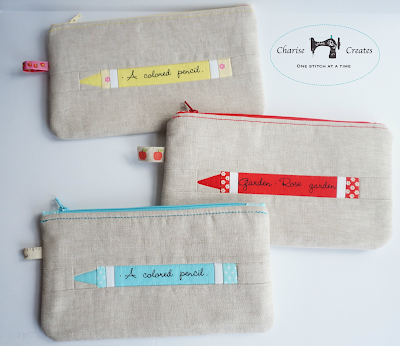 The patterns are free for the year and after that they will be published in a book! "Stitching Fashion" is entirely paper pieced. 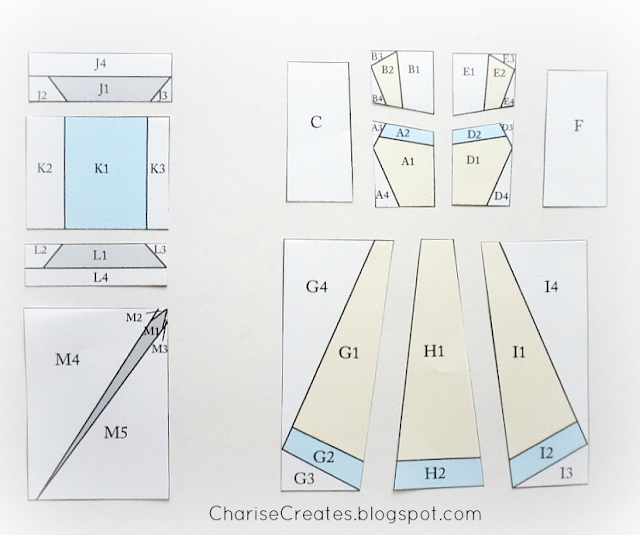 I would consider this an intermediate pattern so if you are new to paper piecing, I highly recommend making my Free Crayon pattern first. 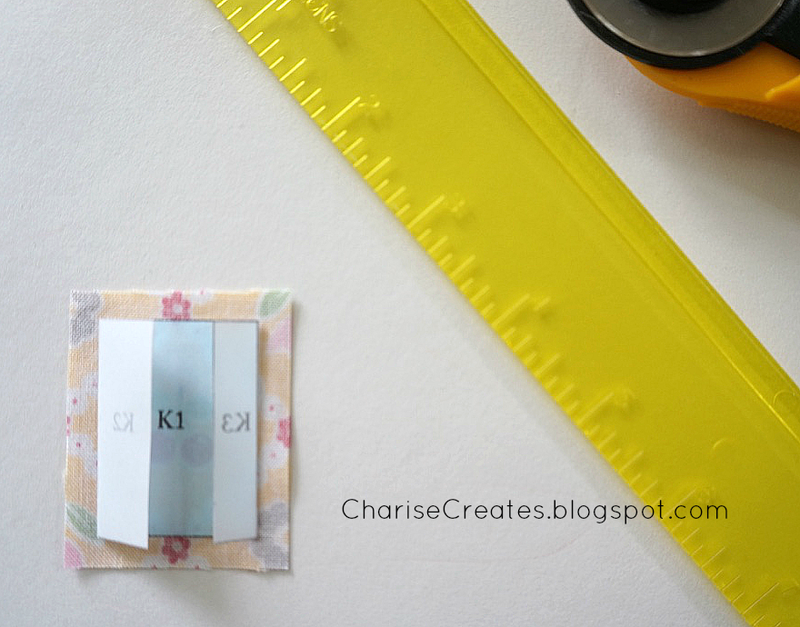 It has detailed instructions to make a paper pieced crayon block as well as a comprehensive list of my favorite tools and notions I use for paper piecing. I also have a tutorial for a fun pencil pouch you can make with your crayon block! 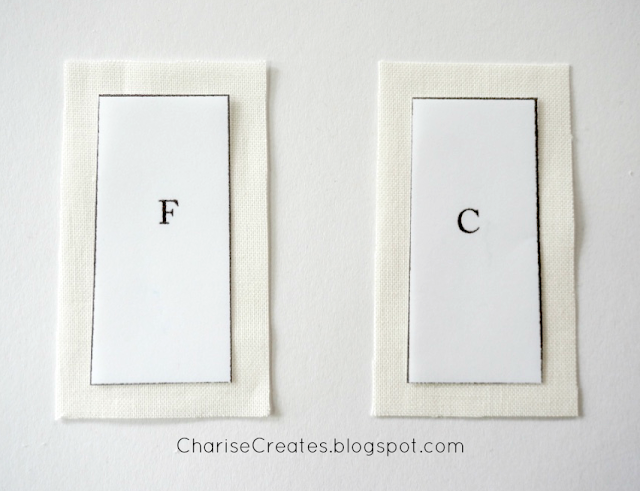 You will want to cut the pattern apart by letter unit as shown above. ***My patterns do not include seam allowances. Paper Piece each individual letter unit being sure to add 1/4" around each pattern section. 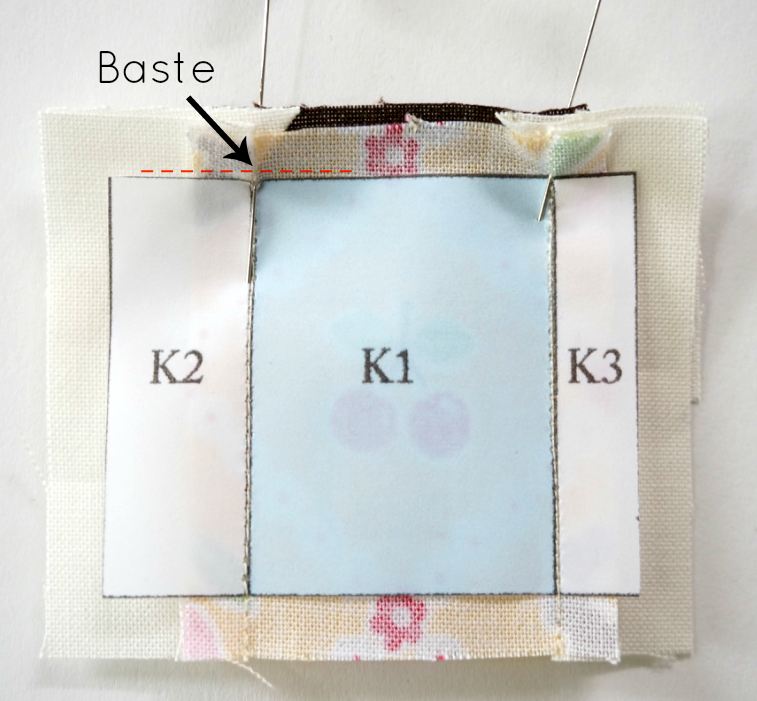 For letter units with only one piece, use a bit of fabric glue or a pin to attach the pattern piece to the wrong side of the fabric. Cut around the pattern piece leaving 1/4" seam allowance. The reason I prefer to not have bulky paper seam allowances is that it helps make it easier to sew the individual lettered sections together. I want to make sure that the seams match perfectly. I will be sewing the top of the spool to the middle spool section. First, find the seam intersection and put a pin through that point on the wrong side. Find the corresponding point on the other piece. Pin together with right sides together. Open the seam and check if the points match. If they do not, remove the basting stitch and try again. 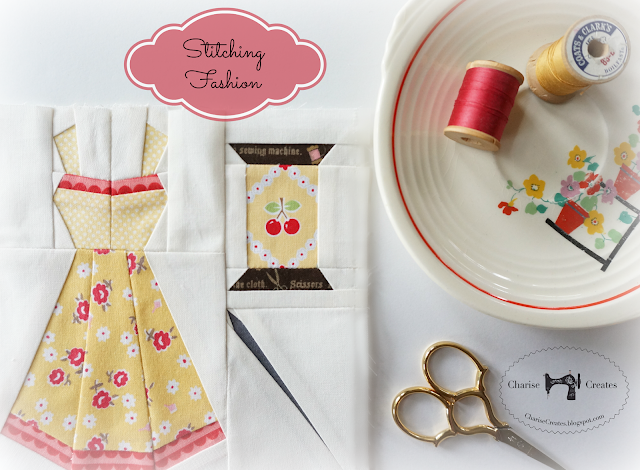 If they match, stitch the seam with 10 - 12 stitches per inch back tacking at the beginning and end of the seam. I absolutely adore fussy cut blocks. It is such a fun way to add an extra special touch to your block. 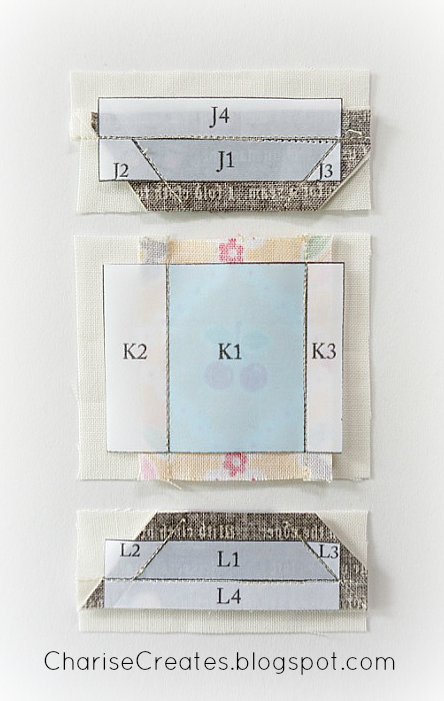 Figure out what motif on your fabric you want to fussy cut. I decided I wanted a cherry on the center of my thread spool. 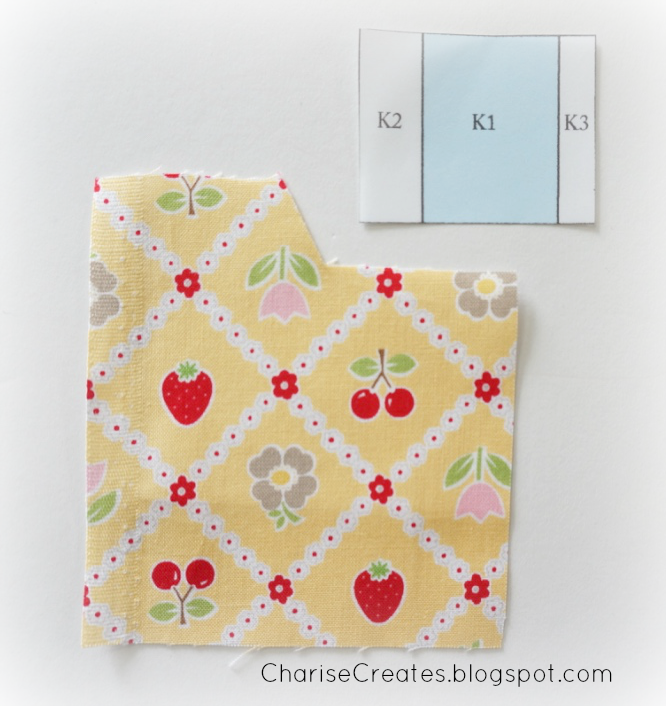 Place the pattern over the motif on the wrong side of the fabric. 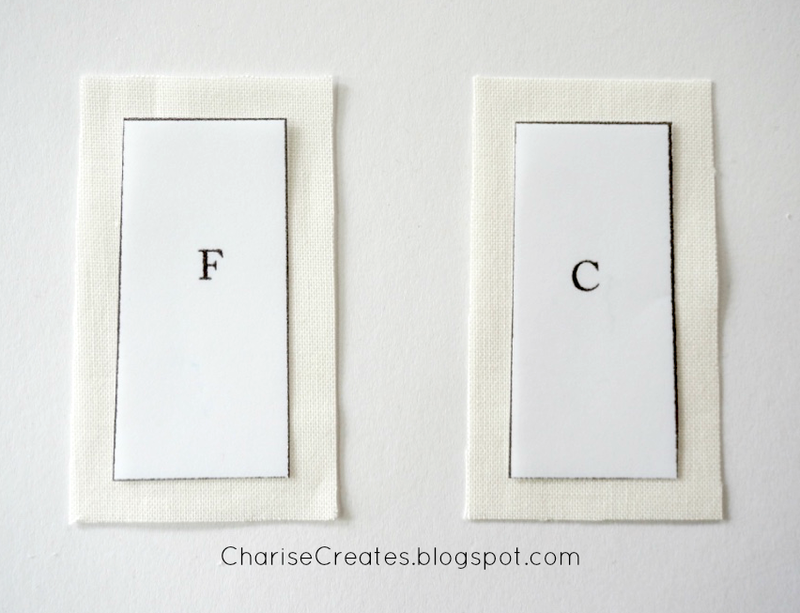 Use fabric glue or a pin to secure in place. 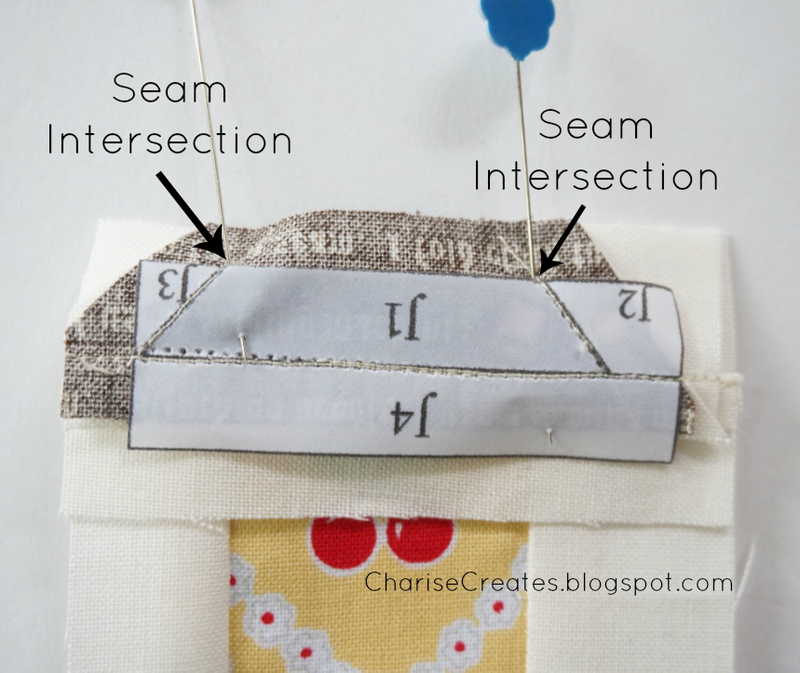 Fold the pattern back on the seam lines and trim around the section leaving a 1/4" seam allowance. 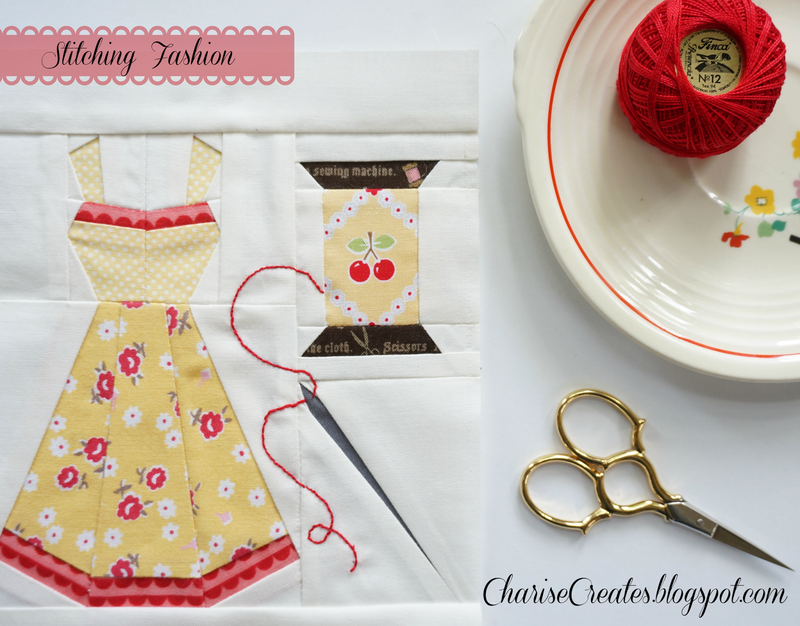 I love the yellow and red fabrics used for the block! Hope Chest by Connecting Threads, Calico Days by Lori Holt for Riley Blake, Micro Dot by Lecien, Red Scallop by Bonnie and Camille, Yellow Ground Fruit - Lori Holt for Riley Blake. The brown fabric I used for the spools is an older Japanese print I've had in my stash for ages. Sadly, there is no information on the selvage. I hope you enjoy making the block. It was lots of fun to design! Oh WOW - what a lovely block Charise. I look forward to making it. Thank you so much for sharing your talents. It's gorgeous....thank you. I look forward to the pattern being posted later. Yowza! What an awesome block! So darling! 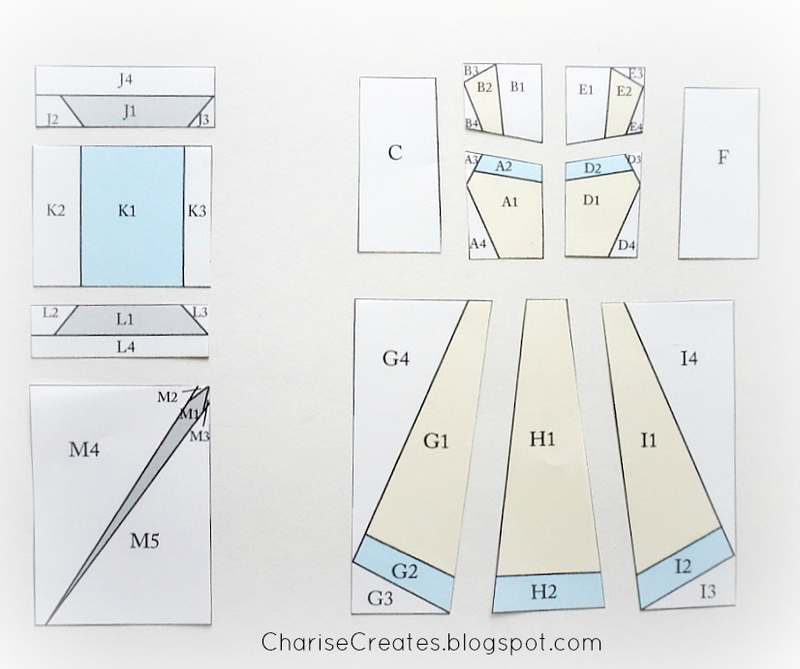 Appreciate your tutorial on paper piecing. It's been awhile since I've paper pieced, so this was great. Super job! Thank you so much for this adorable block for splendid sampler. I will enjoy selecting fabric and sewing it. 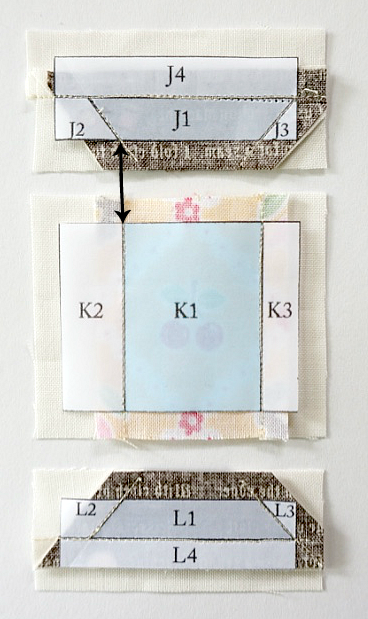 I have not mastered paper piecing so I really appreciate the tutorial as well. So adorable. What a great design. Thank you! 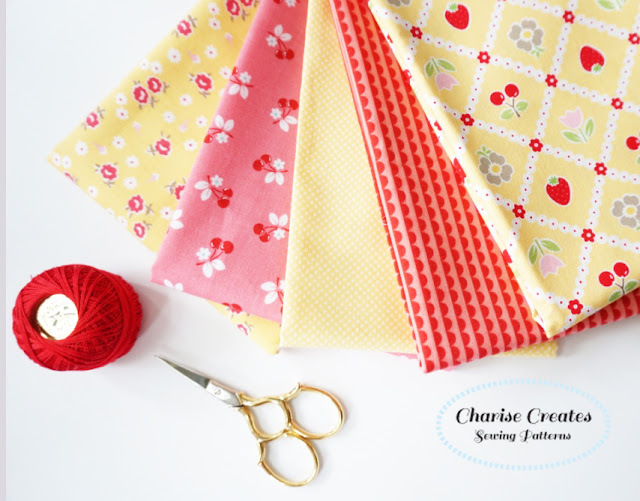 Thank you so much for being part of our Splendid Sampler quilt Charise!! 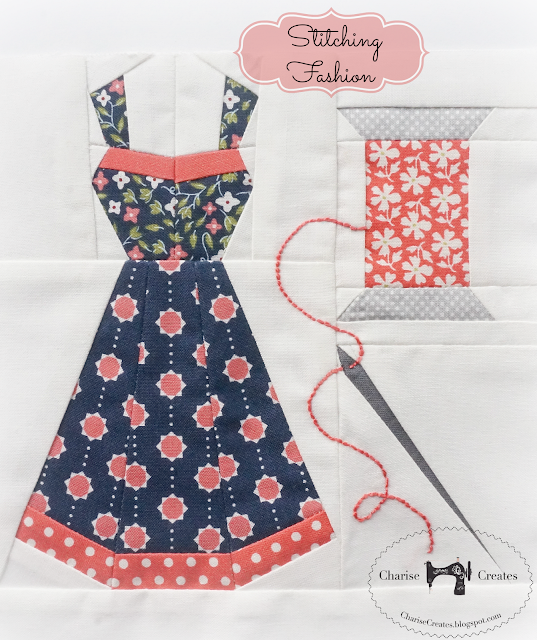 I love your block as i started by making dresses too... and i can't wait to make it! Just fabulous! The Splendid Sampler introduced me to paper piecing and I just love it. Let's see if I am intermediate enough to tackle this wonderful block after just doing the two previously paper pieced Sampler blocks. Thank you, thank you! Love this block! So cute! 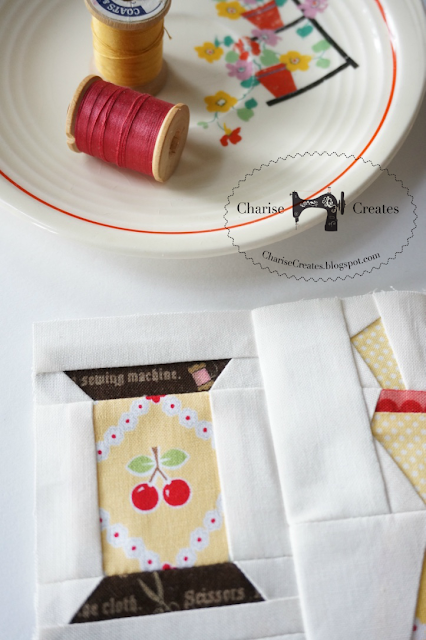 I love paper piecing and your block is adorable!!! 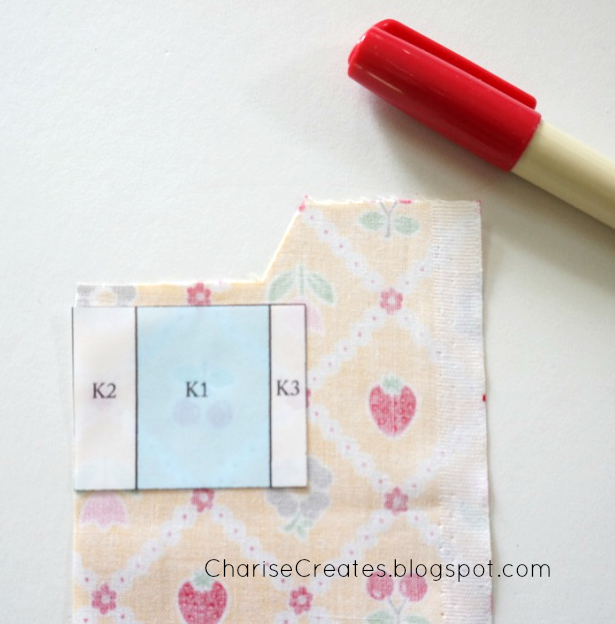 I LOVE this block - I must say it's my favorite paper-pieced block I've ever worked on. Thank you so much!